Bankers and officials often say that the cryptocurrency market is a reliable way for criminals to launder their income. Their logic is simple: they do not control cryptocurrencies, such transactions cannot be tracked, and it means that such illegally received money can be easily converted into Vcash, Zcash, Monero or Dash. 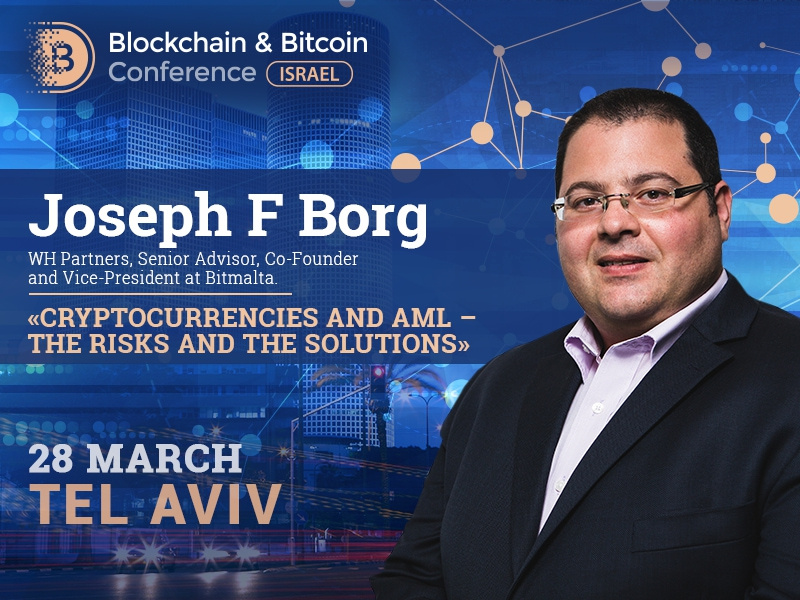 In this interview, the Senior Advisor, Co-Founder and Vice-President at Bitmalta, speaker of Blockchain & Bitcoin Conference Israel Joseph F Borg will reveal whether cryptocurrency is required as a money laundering tool, why the authorities want to eliminate the anonymity of e-wallet addresses, as well as which countries are most successful in cryptocurrency regulation. BCI: Authorities of various states, financial regulators, and cryptocurrency opponents refer money laundering to the main digital coin problem. However, according to FDD’s recent report, money laundering accounts for less than 1% of the total number of bitcoin transactions. Who’s in the right? Is money laundering a real problem of the cryptocurrency industry? J.B.: Money laundering is a problem of cryptocurrencies as much as it is a problem of the Dollar or the Euro. In truth, paper money is a much bigger problem than bitcoin since bitcoin transactions are easily viewable and verifiable on a public blockchain while cash transactions leave no trace whatsoever. However, it is also true that since exchanges are not regulated, the potential problem remains there. If states, authorities, financial regulators stop complaining and moaning about the problem and instead regulate cryptocurrency exchanges, they would resolve 90% of the problem. BCI: Next year, the EU Committee is going to introduce a cryptocurrency regulating bill. Besides, it is planning to eliminate anonymity of e-wallet addresses and make exchanges more transparent. Taking into account the core and operational concept of cryptocurrencies, will these rules be efficient, and in what way? J.B.: As I said earlier, regulation of exchanges is a step in the right direction, not only to fight money laundering, but rather and more importantly to protect customers and ensure that exchanges are running in a professional and secure manner. It will be tricky to regulate decentralized exchanges but in my opinion these pose a more limited risk as they are, in general, more secure and transparent than centralized exchanges. On the other hand, the elimination of anonymity of e-wallets is something that, in principle, goes against every logic of blockchain and cryptocurrencies. Why should everyone (and when I say everyone, I mean the public in general not just the authorities) know how much money I have. Furthermore, this will pose major security risks for wealthier people. Not to speak of the technical difficulties to implement this. How can the authorities control paper and hardware wallets which are the best practice of storing cryptocurrencies? BCI: How do you think, is it possible to solve the money laundering issue in the crypto industry? J.B.: Let’s start by the fact that nowadays everything is considered money laundering, including tax evasion and the laundering of proceeds of minor and victimless crimes. I remember the time when money laundering referred to the laundering of proceeds of major crimes such as drug trafficking, terrorism and prostitution. With the new definition of what constitutes money laundering, I do not believe there is a way of eliminating it completely, not just when it comes to cryptos but in general. With cryptocurrencies, the major issues are exchanges and privacy coins. I believe that with proper regulation of exchanges most of the risks of money laundering through cryptocurrencies will be considerably mitigated. BCI: Speaking about cryptocurrency regulation in general, what countries are the most successful in this regard, and why? J.B.: I believe that the only comprehensive regulatory framework being proposed is the one of Malta. The Government of Malta has just issued a consultation document in relation to the proposed regulation of decentralized ledger technology platforms (DLT platforms) and initial coin offerings (ICOs), as well as brokers, exchanges and other intermediaries dealing in virtual currencies and similar assets, in or from Malta. This framework, once implemented, will place Malta as a one of the first jurisdictions to come up with a comprehensive blockchain and cryptocurrency regulatory framework in the world. The proposal mentions three separate pieces of draft legislation, namely the Malta Digital Innovation Authority Bill (MDIA), the Technology Arrangements Service Bill (TAS) and the Virtual Currencies Bill (VC). The TAS will set out the framework for the registration of Technology Service Providers and the certification of Technology Arrangements. This means that DLT platforms and related smart contracts can be registered and receive a seal of compliance by the MDIA. Auditors and Administrators of such Technology Arrangements will also be approved by the same Authority. The Bill will also propose the establishment of a Joint Co-Ordination Board that will ensure that any overlaps in competence by other national Authorities, such as the Malta Financial Service Authority and the Malta Information Technology Authority do not create bottlenecks or confusion to the industry. The VC will provide the framework for the regulation of ICOs and intermediary services providers dealing in virtual currencies, such as brokers, exchanges, wallet providers, asset managers, investment advisors and market makers. The choice of the term ‘virtual currencies’ as opposed to cryptocurrencies aims to ensure technology neutrality of the legislation ensuring that it is future proof in the light of possible future technology advancements. BCI: The ‘Know Your Customer’ rule has been long used in international acceptability constants. However, is it appropriate for ICOs? And what difficulties can appear during its integration into this area? J.B.: If I had to launch an ICO, I would do KYC on whoever is sending me cryptocurrencies in exchange for my tokens. The main reason for this is that I don’t want a criminal to try to launder money through my ICO. The parameters may vary and thresholds may be higher or lower but at some point, from some threshold you will need to obtain KYC, even if ICOs are not regulated in your jurisdiction. This is for peace of mind and possibly, to be able to open a bank account without major hassles.